G83 peck drilling cycle perform the drilling operation in multiple pecks, this technique makes deep-hole drilling easy and economical. Cutting feed is performed intermittently to the bottom of the hole while chips are discharged. As the drilling is performed to the bottom of the hole with feed in multiple small steps, every time a specified depth is made and then drill retracts, then drill makes the next peck, this operation is repeated again and again until the drill depth is reached. Q Depth of cut for each cutting feed (Peck). Once given in program G83 peck drilling cycle is repeated at every axis movement until G80 is given in program to end peck drilling cycle. In the above example code first drill is done at X60 Y28 and second at Y12 and then peck drilling is cycle is ended with G80. 6mm pecks are taken to complete total drilling depth of 17mm. 1- Rapid traverse to X, Y drilling position. 3- Drilling with feed Q deep. 4- Retraction with Rapid traverse to R-plane. 5- Rapid traverse to Q-d deep (d value is specified in parameters). 6- Drilling with feed Q+d deep. 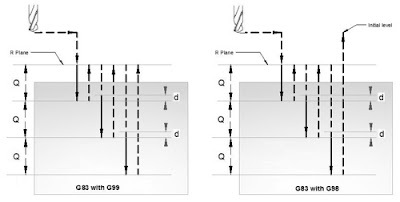 – then drill is retracted to R-plane or Initial-level depends on G99 or G98 which one is given in program. G98, G99 can be used multiple times during G83 peck drilling cycle. G83 peck drilling cycle, drilling operation can be repeated multiple times. The drilling is repeated K times if K value is given with G83. Repeat drilling is normally used with G91 Incremental mode, and a good example of repeated drilling is Grid-plate drilling. For working example see G81 drilling cycle. 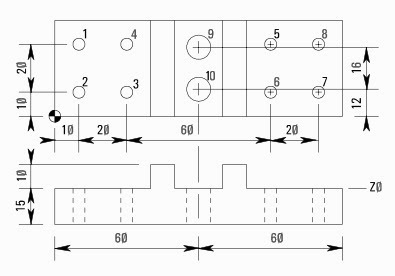 CNC programming example code for the G83 Peck Drilling Cycle. G83 deep hole peck drilling cycle makes the drilling of deep holes a breeze. As with G81 drilling cycle you can do simple drilling in a fast and easy way. But G83 peck drilling due to its specialty of pecking throws away the chips after every cut or peck and this way also the coolant reaches to the bottom of the hole in a free way, so keeps the drill and component cool and clean. 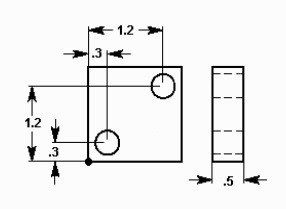 The following G83 peck drilling cycle example code illustrates the use of peck drilling cycle in an easy to understand way, even the beginner level cnc programmers/cnc machinists will understand the working with ease. N5 G83 Z-1.5 Q.5 R.1 F10. 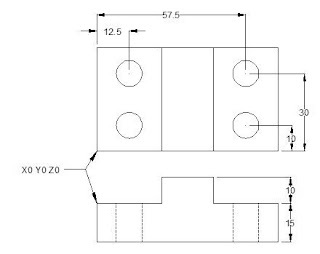 A complete cnc part-program which shows how G98 and G99 (canned cycle return level) work with G81 drilling cycle and G83 peck drilling cycle for drilling of a component which have different heights. G98 and G99 are modal commands that change the way canned cycles (G81,G83 etc.) operate. 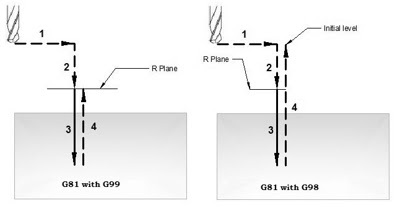 When G98 is active, the Z-axis will return to the start position (initial plane) when it completes an single operation. When G99 is active, the Z-axis will be returned to the R point (plane) when the canned cycle completes a single hole. Then the machine will go to the next hole. N20- Rapid traverse to X10 Y30 Z12, Spindle started clockwise (M03) with 1000rpm (S1000). N30- Drilling starts (G81) at X10 Y30 with cutting-feed (F75) drill will retract to R-plane after drilling operation. N40- Next drilling position Y10 (as G99 is a modal g-code drill will keep on retracting to R-plane until G98 is given). N50- Next drill at X30. N70- Drill at X90 & Retract to Initial-plane. N80- Drill at Y10 & Retract to R-plane. N100- Drill at Y30 & Retract to Initial-plane. N110- Drilling cycle is cancelled (G80), return to reference point (G28) for tool change, stop spindle (M05). N120- Tool change (M06) to tool number 2. N130- Rapid traverse to X60 Y28 Z12, start spindle at 750rpm (S750) clockwise (M03). N150- Next deep drill at Y12 (return to initial point). N160- G83 Peck drilling cycle cancelled with G80, tool returned to reference point (G28), spindle stopped (M05). G83 Fanuc peck drilling cycle. G98 Return to initial point in canned cycle. G99 Return to R point in canned cycle. G28 Return to reference position. M30 CNC part-program end with return to program-start.